Home > Why Organic Fair Trade? We believe in preserving the environment and protecting the health of hard working farmers and you, our customers. Organic farming practices mean that no synthetic fertilizers, or pesticides have been used in the production of your coffee. Not only does this help protect you and the environment from pollutants, but it forces the farmers to utilize sustainable farming practices to grow their crops. In addition to no synthetics being used to grow their crops, organic practices ensure that no genetically modified organisms (GMO) are used. Good may come from the use of genetically modified plants, but the jury is still out. No one knows what the long term consequences of genetically modified foods will be, or what will happen when those plants breed with native plants. We feel confident that God got it right when he created coffee, so we are proud that the gourmet coffees we use are natural in every way. In addition to the reasons listed above, there is new evidence that organically grown foods contain more nutrients and phenolic antioxidants than traditionally grown foods. 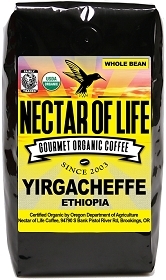 We can only assume that there is more yummy goodness in organically grown coffee as well. Our Organic Coffee Roasting Process is a labor of love and science. We take our roasting very seriously, using state of the art coffee roasters employing both infrared heat exchanger and conversion ration power-burner roasting technologies. We purchased our roasters brand new to ensure that there are no inorganic residues residing in the roasting drum. Nothing but certified organic coffees have touched these coffee roasters. Our premium coffees are roasted in small batches to ensure hands-on craftsmanship and consistency, then they are immediately bagged in heat-sealed one-way degassing valve bags to ensure ultimate freshness. The coffee world is fraught with hardship and inequality. Coffee farmers throughout the world have been oppressed by big business and their fellow countrymen. In Central and South America third party brokers called Coyotes extract hard labor from coffee farmers, paying them very little for their product only to sell the coffee to fill their own pockets. The price a roaster pays for their coffee is no indication of the premium received by the farmer. In addition to unscrupulous third party brokers, big business coffee companies place enormous pressure on coffee farmers to produce coffee at lower and lower prices. The result of these practices is coffee farmers don't have enough money to support their families, or to maintain their crops. 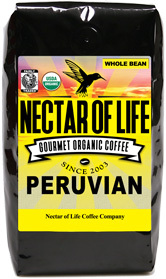 For these reasons Nectar of Life Coffee Co. only purchases certified Fair Trade coffees. The Fair Trade program ensures that coffee farmers directly receive fair wages for their hard work. When a farmer grows coffees organically under the Fair Trade program they are paid an even higher premium for their certified organic coffees, which is good for the farmer and good for the environment. By supporting Fair Trade we help make the world a better place, and ensure that coffee farmers have enough money to maintain their crops to produce the highest quality gourmet coffees. 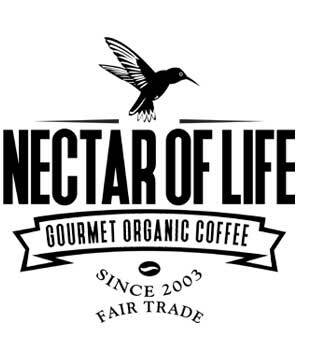 Nectar of Life Coffee company believes that by only purchasing certified Fair Trade organic coffees we can help preserve our environment, society, and human rights.